The best thing about Baskets has to be its offbeat, tragicomic tone. Most new series’ struggle with a few things right out the gate—predictable storytelling, clumsy character introductions, a vaguely rough approach—but the best shows almost always have an innate grasp of tone, how it wants to feel to an audience. The storytelling in Baskets may be flexible, and the humor can range from broad slapstick to strange dialogue delivery, but its tone is set, and arguably the one thing the series asks of its viewers is to lock into it. For the past three weeks, the series has adopted a feeling of low-humming dread; even at its funniest, it’s a dark show not because of content, but because of its sense of dreamy despair, like everyone’s half-awake and partially aware of the sadness of their situation. 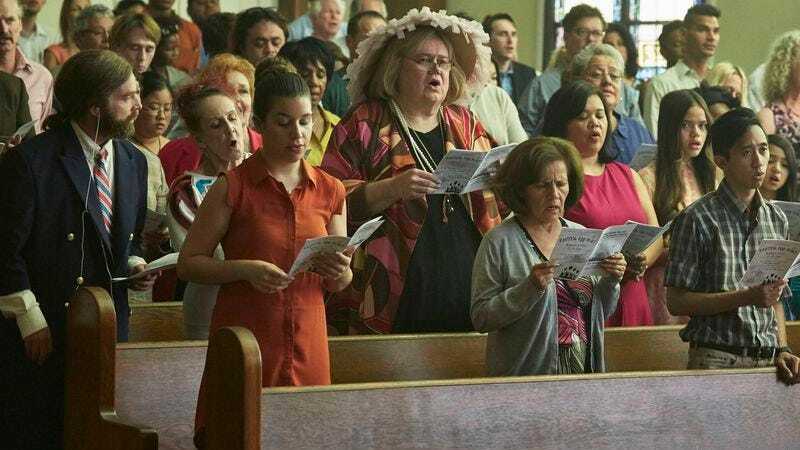 “Easter in Bakersfield” is the best episode of Baskets so far because it strongly commits to that “dreamy despair” but never treats it bluntly. The episode’s plot is fairly simple—Chip and his mother go to church and brunch on Easter Sunday—but it’s filled with strange little moments that put you in an uneasy headspace: Chip and Ernest drinking something called “bunny juice” at the bar; the sharp flashbacks to Chip’s time in France; the drone of the conversational French tape that Chip listens to throughout the episode; the fake Neil Diamond song that gives the episode its title. Director Jonathan Krisel and episode writer Samuel D. Hunter thoroughly ground the episode in the reality of the series’ world, but leave room for the small oddities that keep everything a little off-balance. These oddities are there for their own sake, but they also make the dramatic moments in “Easter in Bakersfield” much more affecting simply because there’s no obvious build to them. Christine Baskets loves Easter Sunday and wants nothing more than to go to church and eat at the casino buffet, but Chip can’t be bothered to care. He’s constantly sneaking off to smoke cigarettes and to listen to his tape, casually hurting his mother in the process by simply not being present. Some of this comes from Chip’s knowledge of a world outside Bakersfield (there’s a great bit with the French tape where the voice starts speaking in apropos phrases like, “I wander endlessly about” and “It’s a very small world here.”), but some of it has to do with a personality fueled by bitterness and misery that manifests itself as rudeness. Chip went to France to become a professional clown, and though he’s technically living his dream albeit on a small scale and in his hometown, he still has trouble swallowing the consequences, like his mother’s supposed disappointment. But despite her oft-snide remarks and occasionally condescending tone, Christine loves her son and does her best to stand up for him. One of the best scenes in the episode is when she defends Chip to one of her church friends by calling him “a free spirit,” even though he just loudly interrupted the service to tell her that her car is being towed. It’s moments like that that make some of Chip’s behavior hard to swallow no matter how understandable, especially at brunch when he starts lashing out at Martha (and her parents) after she spills the beans about his marriage to Penelope. Yet, Galifianakis and co. have an abiding sense of empathy for their characters at their worst, which make these scenes not just palatable but compelling. Christine so desperately wants to have a nice Easter Sunday. Chip can’t stand the fact that he’s even with his mother on Easter Sunday let alone in Bakersfield at all. Those two personalities—one suffocatingly pleasant, the other brittly caustic—clash in fascinating ways. “Just stop this. Stop this madness, Chip,” Christine begs her son at the table, but Chip just can’t. All he wants to do is smoke and sulk, and he can’t do that in the casino dining room. The final poignant scene with Chip and his mother at the slot machines just makes this episode because it gives both characters a moment of grace. After being shamed out of a desert by her own mother’s tirade about her weight, Christine leaves the table and sits next to Chip at the slots. Chip apologizes for not telling her that he was married and gives her some Easter candy right after Christine hands her son an ashtray. The two of them give just enough to allow the other a little freedom to be themselves. “My life is in disarray, Mama,” Chip tells his mother. “Whose isn’t?” she responds. “Whose isn’t?” That’s the rub. 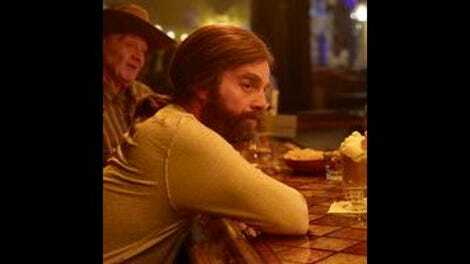 Baskets explores the feeling of living a life thrown in disarray. Some people like Christine and Martha are comfortable with their own messes, while others like Chip are still struggling. Baskets never promises hope for its characters, but it does promise a tender understanding, and sometimes that’s all you need. The funniest scene in the episode by far is Chip trying to get his mother’s attention during the service, but other funny scenes include the awkward shifting of the tables so Martha’s family and Chip’s family can sit together, as well as when Chip pretends to be Dale with the little kid. Chip trying to smoke a cigarette with a broken tip is wonderfully appropriate. The best bits of physical comedy are 1) Galifianakis trying to get into the backseat of his mother’s car from the passenger seat, and 2) Chip’s mother shoving Chip into the nook between the seat and the car door when he tries to change the radio station.